The Truform Knee High Anti-Embolism Compression Stockings with Open Toe provide superior support for those in need of compression therapy while on bed rest or after a hospital stay. The moderate compression reduces the risk of blood clots and the risk of venous diseases. There are four different points on the stocking that act as check points to measure the compression level making sure there is a proper distribution of pressure. In this way they not only prevent disorders and increase the overall health of veins, but also decrease pain in the legs. Truform Leg Health Below Knee Stockings with Open Toe are also incredibly comfortable. Made from a knit blend of nylon and spandex material, the compression stockings have plenty of give to move with users through out the day and without cutting off the circulation in the legs. There is no latex included in the material for the socks, making them completely safe for those who may have latex allergies. 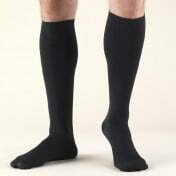 Knee Length 18 mmHg Truform Compression Socks Open Toe are easy to pull on with minimal strain on the user. They have a defined heel knit into the design to easily orient the best fit and to make sure they stay in place. The top of the sock fits just below the knee and has a soft and flexible band that also helps the stockings to stay in place during movement. The band moves with the body and stays in place securely without assistance from a garter belt or other device. Fit well and don't fall down (so far). I like the open toe so I can wear sandals. The color is not very good. It would be nice if they would come in black and blue.